What is the 5,000 Miles of Wild Campaign? Hydropower: Is It Really “Clean Energy”? Hydropower: Is It Really "Clean Energy"? 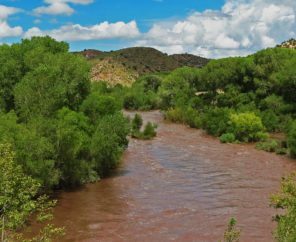 Rivers and their restoration are complex, and any effort to rehabilitate a river system needs to be based on a sound understanding of the ecological benefits and drawbacks of a proposed restoration plan. Over the past three decades, the scientific community has advanced our understanding of rivers and helped us to realize the significant negative impacts that dams have on river systems. Dams disrupt a river’s natural course and flow, alter water temperatures in the stream, redirect river channels, transform floodplains, and disrupt river continuity. These dramatic changes often reduce and transform the biological make-up of rivers, isolating populations of fish and wildlife and their habitats within a river. Connectivity (e.g., migration of fish and other organisms). While there are some limited short-term ecological consequences of dam removal, Bednarek’s study found that the long-term ecological benefits of dam removal—as measured in improved water quality, sediment transport, and native resident and migratory species recovery — demonstrates that dam removal can be an effective long-term river restoration tool. 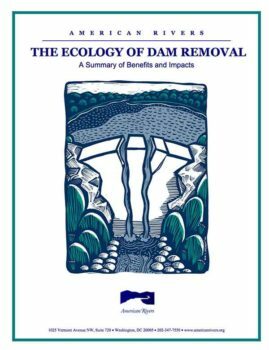 This paper summarizes Bednarek’s findings and comments on Bednarek’s call for additional research to further the scientific community’s knowledge of the ecological impacts of dam removal. The paper is organized into five sections: (1) reestablishment of a natural flow regime; (2) transformation from reservoir to river system; (3) change in river temperatures and oxygen levels; (4) sediment release and transport; and (5) migration of fish and other organisms. Bednarek’s paper was published in the journal, Environmental Management, in spring 2001 (Bednarek, Angela. 2001. “Undamming Rivers: A Review of the Ecological Impacts of Dam Removal.” Environmental Management 27(6):803-814.). To obtain a copy, please contact the Rivers Unplugged campaign at American Rivers by calling (202) 347-7550. Please enter a value between 0 and 1000000. ©2017 American Rivers, All Rights Reserved.